The Healthy Kids Community Challenge Hastings & Prince Edward “Water Does Wonders” is an initiative to promote children’s health and increase the number of water access points available in Hastings and Prince Edward Counties. 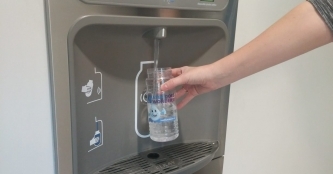 The Municipality of Tweed submitted an application to receive a new hydration station at our Tweed Community Centre and we are happy to announce that our application was successful. The new hydration station will be provided by the Health Unit and installed (at no cost to the Municipality) in the next couple of months. Mayor Jo-Anne Albert, who also happens to be the Champion of the program, quoted "I am so happy that we were successful in our application. This hydration station will give all youth an opportunity to have a healthy alternative to high sugar sweetened beverages." Having a new, clean water fountain will not only encourage drinking tap water, but the water bottle refilling option will also increase water consumption by allowing the many patrons, especially youth, that use our community centre for various sporting and recreational events to have access to clean, safe drinking water. The Municipality of Tweed wants to promote and encourage all residents, from youth to seniors, to be healthy through physical activity and developing healthy habits. Sporting activities are an essential component to living a healthy active lifestyle and having water as a healthy alternative at every sporting event will motivate people to use our new hydration station. To learn more about the Healthy Kids Community Challenge Hastings Prince Edward, please go to www.healthykidsHPE.ca or visit their Facebook page @healthykidshpe.ca.